Website, Hosting, and Content Management. RDN Global is a long-term client of DYSC IT Solutions which hosts various networking events and business project opportunities that brings together service providers and government officials given the ability to choose outsourced providers to improve specific aspects of Latin America. The events range for infrastructure and building to leadership development lessons. 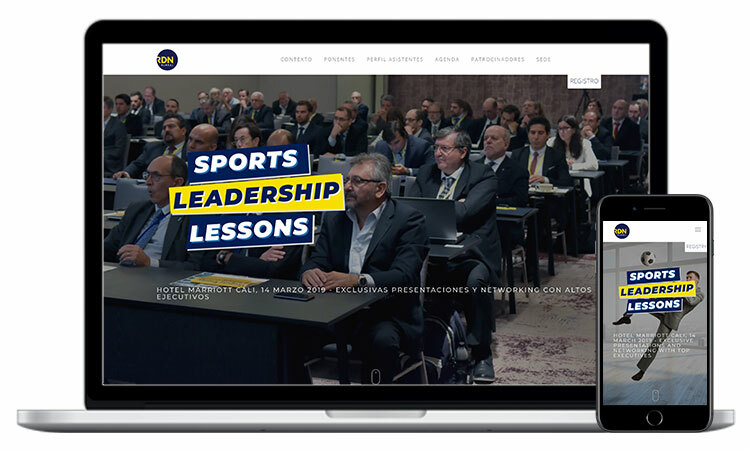 The website was designed to promote the specific sports leadership event in an extremely popular Latin American city of Cali, Colombia. We have developed a website based on a collaborative design between both teams and included features commonly associated with similar businesses. The website was created using DYSC CMS and comprised of a completely custom theme. RDN Global needed a website to be used for promotional purposes to their extensive list of Latin American clients. They needed to promote a specific and unique event that involved large sportspeople providing advice and talks around sports leadership lessons. RDN Global proposed an adaption of a previously successful website design with various amendments to suit the unique event. A result of the event being a unique, new venture and the client requesting amendments to a previously successful website design that was provided by DYSC IT Solutions. We created a professionally designed website that promoted and detailed about the specific event that would be distributed to RDN Global&apos;s extensive list of clients.